The 147-inch wheelbase Daimler DE-36 chassis was powered by a 150hp straight-eight displacing 5460cc (5.4L). The large, silky smooth engine was coupled to a Daimler Fluid Flywheel transmission, controlled by a pre-selector mechanism. Factory documents indicate as many as 216 DE-36 chassis were built, with the final units being dispatched in 1953. As would be expected, the lengthy DE-36 chassis were most often fitted with heavy, formal limousine coachwork. 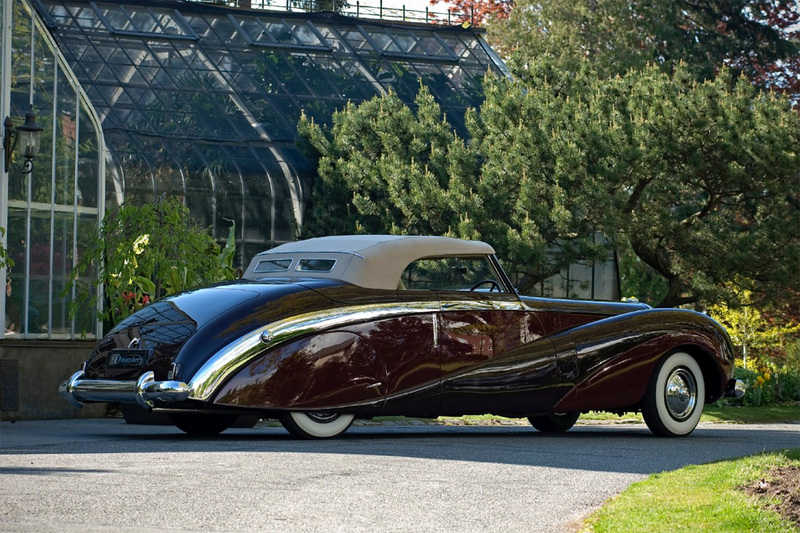 Delightful exceptions to the rule were the six magnificent DE-36 drop-head coupes created by Hooper’s in the style of Sir Bernard’s prototypical 1948 show car. Although delivered in various colors, all of the Hooper DE-36 drop-heads are popularly known today as Green Goddesses. Story by 2010 Bonhams 1793 Ltd.